Tuesday, September 19, 2017, 5 p.m. Le 19 septembre 2017 prochain, l’artiste belge Adrien Lucca sera de passage à Montréal pour partager avec le public son expérience de réalisation de l’œuvre d’art public Soleil de minuit. La conférence, qui aura lieu à la Galerie de l’UQAM dès 17 heures, permettra d’en apprendre plus au sujet de la conception de cette série de 14 vitraux située dans la station de métro Place-d’Armes. Le 21 juin 2015, premier jour de l’été et jour le plus long de l’année, le soleil se levait à Bruxelles. Au même moment, à Montréal, il était presque minuit. À l’aide d’un spectrophotomètre, l’artiste Adrien Lucca a enregistré le spectre lumineux de ces premiers rayons de l’été bruxellois. Utilisant des verres colorés et un éclairage à diodes électroluminescentes, il a conçu Soleil de minuit, une série de vitraux reproduisant les couleurs intenses de ces lumières naturelles. Des outils informatiques et physiques lui ont permis de choisir les combinaisons de verres colorés. L’artiste marie les techniques artistiques traditionnelles (le dessin, la peinture, l’impression, le vitrail) avec des méthodes d’analyses scientifiques et des outils numériques. Fruit d’une collaboration de l’artiste avec des maîtres verriers belges et des fabricants de verre allemands, l’éclat virtuel de Soleil de minuit, démultiplié en 14 étapes, symbolise l’amitié entre les villes de Bruxelles et de Montréal, la mobilité, ainsi que la permanence de la relation entre l’intelligence du sensible et celle du savoir à l’oeuvre dans toute création artistique. L’œuvre est un don de Bruxelles Mobilité à l’occasion des 40 ans du métro de Bruxelles, des 50 ans du métro de Montréal et des 375 ans de Montréal. En contrepartie, la Société de transport de Montréal (STM) offrira une œuvre de l’artiste montréalais Patrick Bernatchez qui sera installée à la station de métro Trône de Bruxelles. La conférence est organisée en collaboration avec la Délégation Wallonie-Bruxelles au Québec. Né à Paris en 1983, Adrien Lucca vit et travaille à Bruxelles. Depuis plusieurs années, il développe une pratique artistique multiforme (dessins, installations, éditions, conférences) autour d’une étude scientifique de l’utilisation de la lumière et de la couleur. Cette méthode combine l’utilisation d’instruments de mesure de laboratoire avec des algorithmes informatiques et des méthodes artistiques de production. Un grand merci à Louise Déry, Anne-Marie Ninacs, Caroline Pierret, Wallonie-Bruxelles International, la STM et Bruxelles Mobilité ! With the studio Debongnie (http://vitraux-debongnie.be), we are working on a Stained-Glass prototype to be installed in a 13th Century Cistercian Abbey in the south of France. My project passed the pre-selection and we are in the final of the competition against 2 other duos artist/glass-studio. Cistercians didn’t put colors, pictures or crosses on their windows. Their windows were supposedly « albae fiant, et sine crucibus et pricturis » (white – or colorless(?) -, and without cross and representations). Very few original 12 & 13th Century Cistercian windows survived and we know little about how they interpreted this rule. My proposal is to produce “white light” in the Abbey, by a combination of different optical types and colors: transparent light greenish blue, light blue and light reddish blue mostly, and opalescent whites that diffuse light and are less transparent. During the course of a sunny day, the light will vary. The visual appearance of the window will be changing a lot because of this variation. Behind the window is a yellowish-white stone-wall. Before noon the window and the wall behind it are in the shadow. Around noon, the sun illuminates the window directly and the opal glass are becoming very bright. During the afternoon the wall behind becomes illuminated, allowing the transparent colors to appear. Finally around 4-5PM the shadow moves on the window and the opal glass stops being so bright. Interestingly, opal glass will appear white but will project amber light on the walls or the floor of the building. The average color of the light passing through the window has been computed to be white. The glass selected last month in the factory Lamberts in Waldsassen were chosen to produce this effect, and the situation has been simulated with the light spectrum as measured last summer in the south of France. Finally, there’s the possibility of seeing the sky from an angle in the Abbey. When people will look at the window with the sky behind, it will reveal new colors again. What looked almost colorless will appear as different shades of blue and yellowish whites. Finally, the glass version ! This is a stained glass element made with a traditional technique. The black lines are a combination of hand painted “grisaille” and lead. When working with mouth-blown “Antique” glass (the glass traditionally used to make stained-glass), the irregularity of the material is a given property. Every sheet is unique and its thickness varies between 2 to 6-7 mm, with an average thickness of about 3 mm. For perfectly transparent sheets, the color of the glass depends on the thickness of the material. If you want to have a high-level of control over the color that you want, a possibility is to measure the glass thickness using a digital camera and a light table. However, this is not easy. The light-table non-uniformity has to be taken into account to correct the pictures, as I did here. 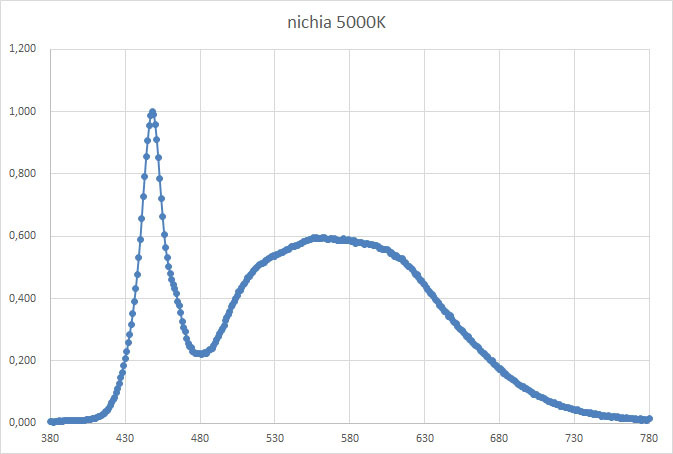 It’s been a few months that I’ve been developing software/hardware solutions to perfeclty measure the transmission of light that is characteristic of every single piece of mouth-blown glass. It now works pretty well. (above) two sheets of Antique mouth-blown glass presenting strong color irregularities versus (below) the original measured samples of the same references at the Glasshütte Lamberts factory last summer. The chemical composition of the material is the same, but the thickness greatly varies. How to deal with such differences? Stained-glass is a very special material to work with. One one hand, the colors of some glass have absolutely unique properties: the light that passes through it is so well filtered that it produces a color that is more pure than any other material (with the exception, maybe, of some dyed gelatin filters – however gelatin filters are very fragile, while glass is almost unalterable). On the other hand, Antique stained-glass is produced by manual workers (it is mouth-blown) in coordination with chemists that “tune” the glass chemical composition in massive ovens. The result is a very beautiful material that present a lot of natural variations of thickness and of color. Some stained-glass are colored in their mass, while some others are “plated”: a sheet can be made of 2 or 3 layers of different colors that are superimposed. The upper plate is usually very thin (up to +- 1/10th millimeter or less), and very “concentrated”, i.e., if the plate is thick the color can easily turn almost black, while it would be Pink at 1/10th mm. Depending on the spectral characteristics of the chemical components involved, the thickness can matter or not. Strangely enough, some orange selenium-glass sheets don’t change colors if they are 3 or 5 mm thick, but become strongly lighter if they are less than 2 mm thick, for example. This is a consequence of the spectral transmission curve of this particular colored glass. When I was visiting the stained-glass studio Parot in Paris a few months ago. I saw a similar phenomenon: a 10 cm thick piece of fused glass (silver-yellow I think), made of a bunch of yellow glass plates, had exactly the same color as one of these plates! (The explanation is easy but would take a long time to write). So… with such a difference between the data and the reality, what do we do? There are several possibilities: accepting the natural variation, excluding the parts of the glass sheets that are too different (if we have enough stock! ), or correct the data and redisign the pictures progressively, pannel by pannel, when it is possible to introduce more variety. The fact that the glass “natural” color-variations introduce another level of randomness in the pictures is also interesting. So far, the comparison between the computer model and the stained-glass pannel seems fair enough. However, the real test will be made within a few days, when the pannel will be ready to be lighted from behind! (right now the colors are not appearing correctly and it is impossible to tell how it’s gonna look like). Last summer, I was on a trip to Waldsassen, Germany – next to the Czech Republic border – at the Glasshütte Lamberts factory. It is one of the few remaining factories in Europe where colored glass sheets for stained-glass are produced in a traditional way. 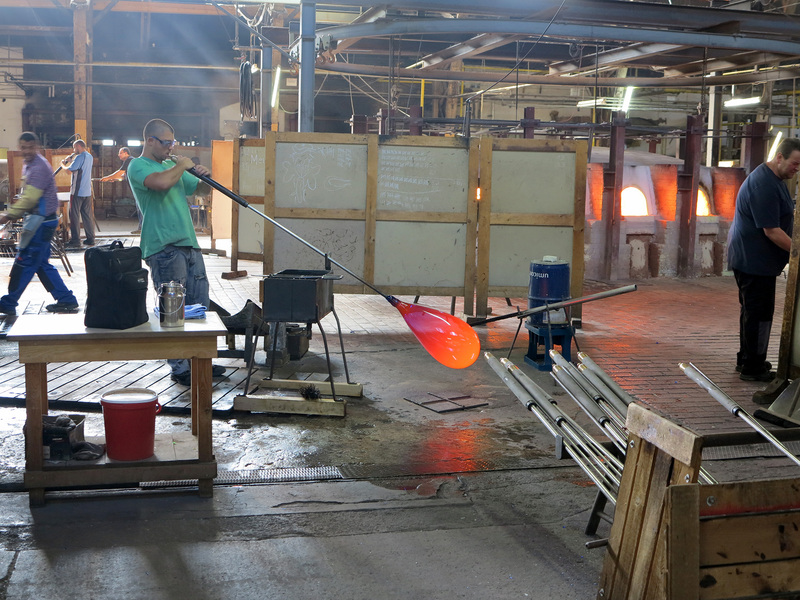 Mouth-blown glass is made every week days by several teams of workers. First shaped as long bottles, the glass is recooked in a secondary step to be flattened into sheets of 0.54 m². I went there to choose the colors that I want to use for the stained-glass project that I am working on. In the “standard” catalogue, Glasshütte Lamberts has a bit more than 250 references. But in the factory, there is much more: around 5000 different glass, the “non-standards”, which I came to see. A part of the factory where 5000 different series of glass sheets are stored, every series being unique, and the office of color-expert and Sales Director Manfred Mislik, where we had a talk about colors. Since I started to get in touvh with people in the stained-glass world several professionals asked me how I will choose the colors. I heard that working with glass is always a challenging experience and that for many artists, it was a difficult or even painful experience, either because there are too many possibilities, or because the appearance of the glass, its transparency, was too different from the logic of for example, painting. When I got there I had a strategy: I came with a spectrophotometer and a light box that I built a few days before. 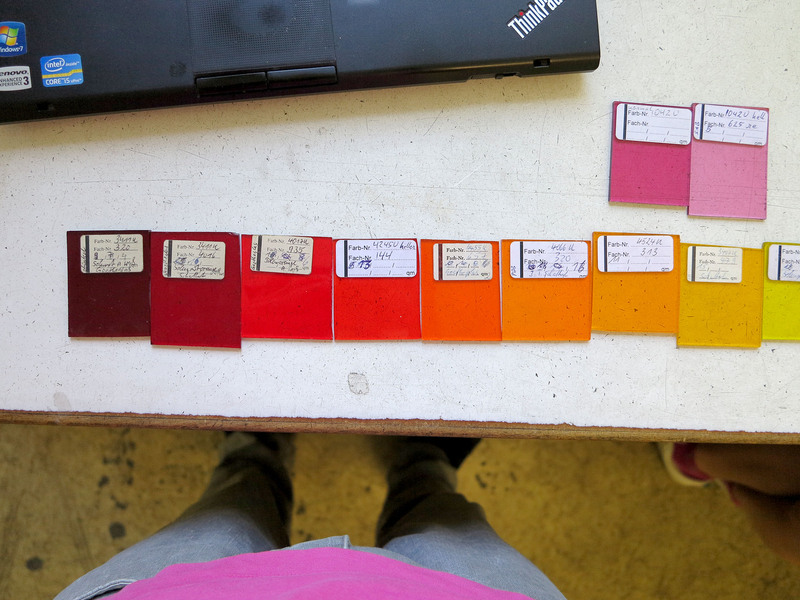 In the office, I made 312 spectral measurements : all the standard catalogue, plus 75 “non-standard” colors that I picked up in the room, especially the very intense types: Plated deep Reds, Selenium Reds, Oranges, Yellows, and Gold-based Pinks. The emission electromagnetic spectrum of the LEDs that I will use in the metro station to illuminate the stained-glass from behind. All of this (the trip, the selection, the spectral measurements and the spectrum of the light source) were necessary pre-requisite steps to be able to start working. Recently I have been very busy with what’s about to become my biggest project so far: after winning a competition I have been commissioned by the region of Brussels to produce an artwork that will be installed in a metro station in Montréal (Québec). Today I have to give the final plan to the stained-glass studio Vitraux Debongnie near Brussels. This includes a final list of glass colors that I have selected in Germany this summer. I measured the transmission spectrum or more than 300 antique-glass samples from Glasshütte Lamberts and I ended up choosing 84 different colors.